Learn the role footings play in keeping foundations from settling and how to size them properly for soil conditions By Brent Anderson, P.E. 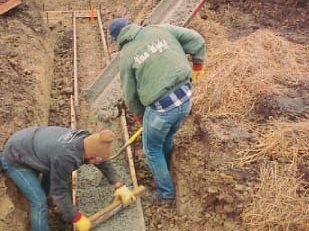 The construction of footings is best left to the pros that can assess the soil conditions and decide on the proper depth and width for the footings as well as the proper placement. The dimensions of footings also depend on the size and type of structure that will be built. Placement of footings is crucial to provide the proper support for the foundation and ultimately the structure. Concrete footings may also be needed for projects such as a deck, pergola, retaining wall or other types of construction. If you know your soil bearing capacity, following these practical guidelines will ensure strong footings. Brent Anderson is a consulting engineer and concrete contractor who serves on the American Concrete Institute Committee 332, Residential Concrete.